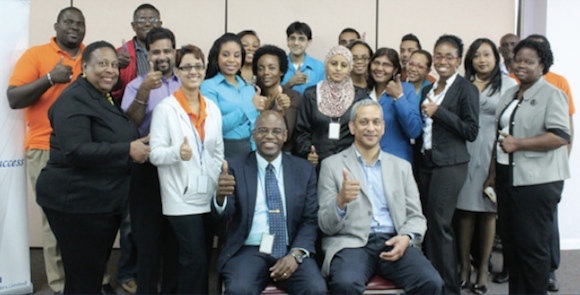 In August 2103, the School of Business and Applied Studies Limited (ROYTEC), at the University of the West Indies, signed a memorandum of understanding for a partnership with the Virtual University for Small States of the Commonwealth (VUSSC). In doing so, ROYTEC agreed to embrace open educational resources (OER) as an operating strategy. ROYTEC’s first VUSSC offering is a locally adapted version of the Bachelor in Business and Entrepreneurship. VUSSC is a collaborative network of over 30 small states that was initiated by COL and is now led by an independent management committee, with support from COL. Fourteen courses and programmes are now being delivered by nine institutions in eight Commonwealth small states. ROYTEC is a private, tertiary-level institution governed by The University of the West Indies, St. Augustine (Trinidad & Tobago). ROYTEC’s philosophy focuses on the seamless transition of young adults from secondary school to tertiary education, the development of teachers to support national objectives for creating a knowledge-intensive economy, and corporate training interventions. In its more than 60 years of existence, The University of the West Indies (UWI) has evolved from a fledgling college in the Caribbean island of Jamaica, with 33 students, to a full-fledged university with over 45,000 students, approximately 9,000 graduates annually and more than 120,000 alumni. It serves 17 nations through four campuses and numerous regional centres. UWI’s Open Campus offers multi-mode teaching and learning services through virtual and physical site locations across the Caribbean region. The resource mobilisation and training phase came next. COL assisted with this by sponsoring two training workshops for faculty and administrative staff to address any knowledge gaps in the use of the Moodle learning platform for courses owned by ROYTEC and released under open content licences initially for VUSSC programmes. Final programme design included programme structure; courses and course credits; assessment, teaching and learning resources; course outlines; learning outcomes; evaluation of teaching and learning; and ensuring alignment with transnational qualification frameworks (COL and ACTT). More details at: Commonwealth of Learning – In Focus. Sign up with Maven for short term consultancies (including surveys and focus croups).